A tasty Sunday lunch option for a perfect Summer’s day! This recipe uses the convenient fresh ingredients Mediterranean pack, from the fruit & veg aisle. Using a sharp knife score the fat of the pork in a criss cross pattern. In a small bowl mix together the grated lemon, thyme leaves, garlic and olive oil with some salt and pepper, then rub that into the pork. Leave the pork to marinade for a few minutes to allow the flavours to penetrate. Place the pork into a roasting dish and scatter the lemon wedges all around. Pop it into the oven and allow to cook for approximately 1 hour, until the pork is thoroughly cooked. If the top of the pork is browning too much you can cover it loosely with some tin foil during the cooking process. Place all the vegetables into a large bowl with the olive oil, garlic and seasoning and mix well. Then transfer to a flat baking tray and pop into the oven with the pork for the remaining 30-35 minutes of the pork’s cooking time. Shake the vegetables once or twice during the cooking process. Mix together the oil, seasoning and potato chunks and place on a flat baking tray lined with parchment paper. 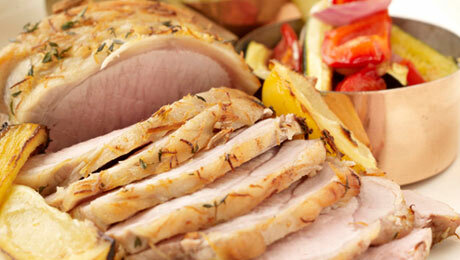 Cook for 35-40 minutes and serve with the pork and roasted vegetables.